Blake Byrne is one of the greatest art collectors in the the country but its his approach and wonderful attitude towards collecting that makes his Open This End exhibition at Lewis and Clark College so invigorating. Speaking with him I got a sense of how art can and does exist beyond the cynicism of the age, bringing us back to core conversations about living on this planet together. Through sharing this collection and the philanthropy of his Skylark Foundation Portlanders have had a rare opportunity to get to know this one time resident. The exhibition consists of established masters like Warhol, Acconci, Kippenberger, Martin, Richter, Kelley and Nauman as well as younger artist like Wangechi Mutu, Marlene Dumas, Jennifer Steinkamp and Kehinde Wiley but its the vitality of discussion that shines through. Mr. Byrne is that rare collector who becomes a patron early in an artists career... he also owns works by some of my favorite Portland artists like Ellen George and DE May. We had a spirited discussion about life and art. Jeff Jahn: I dont know if you have been able to travel to see this exhibition in Portland yet but part of what I am intending to do by conducting this interview in the gallery is to at least give you a vicarious sense of others looking at what you have so graciously lent to us here. Blake Byrne: I havent, because I have been under the weather. I had an operation and have had radiation treatments and Ive been recovering. I missed the opening and hopefully I can get there before December the 11th. BB: Well as a kid we traveled a fair amount and obviously the first place you go when you visit a new city is a museum. My mother always took me to museums and I did the same thing with my children. I remember once saying, Now Dad promise, only one museum and one church a day. (laughs) Maybe that is the unspoken motto of the family. JJ: Now where did that natural curiosity come from because a lot of people just go to the tourist sites like a viewpoint, a famous restaurant, or climbing a tower rather than specific cultural adventures? BB: Well my parents collected art, done by friends so we always had original art in the house but no famous artists or trophies or anything like that. Perhaps the closet thing I have to a trophy is a small print by Grant Wood that they owned. Besides works by friends my mother dabbled so we had some of her things up so I was used to having art in the house. And then as I went off on my own my former wife she and I picked up things on our honeymoon in Europe and then we moved to Oregon at one point. We collected some artists in Oregon and Rhode Island. These werent just relatives and friends, these were actual artists out of galleries. We bought from Arlene Schnitzer, who was an influence on us when we lived in Portland. Then after we were divorced she kept most of the art, I got several pieces then I started collecting on my own. That's the history of that, she was more interested in art than I was in all fairness. But one place I got involved was I was sales Manager for KPTV channel 12. That was the independent station but now it is the Fox station I believe. BB: There was a time that it was an independent station, it had very high ratings and very close to being the highest independent station in America and had a prime time of Perry Mason and Merv Griffin. Those programs did extremely well. At one point it was the 75th Anniversary of the Portland Art Museum and I came up with the idea of doing a program and since I was the General Sales Manager I was pretty tight with General Foods so they agreed to sponsor it. Well holy mackerel that was a breakthrough so we did an hour special (maybe it was longer) of the 75th Anniversary of the Portland Art Museum. Of course to this day nobody can find the original tape. The museum doesn't have it, the Archives of KPTV doesnt have it. Its probably in some mislabeled box somewhere. That would have been fun to include in the exhibit. JJ: Archives are always spotty in Portland for some reason but perhaps it will turn up in a garage sale somewhere or this interview will bring it out of the woodwork? BB: So that was where the interest came from and moved along and after we divorced in 1985 I moved to New York and lived down the street from the Jack Tilton Gallery and Marian Goodman Gallery etc. Jack Tilton said, go to Basel Switzerland and look around and see what you like? So I thought that sounded like a fun idea and I liked to travel anyhow. So I went to Basel and bought six pieces so that was the beginning of the collection... of my personal collection. JJ: wonderful , so onto that I thought Id just ask you about specific works on display. One of the striking thing about the installation to me is you have two works by two very different artist that are obviously related to each other. 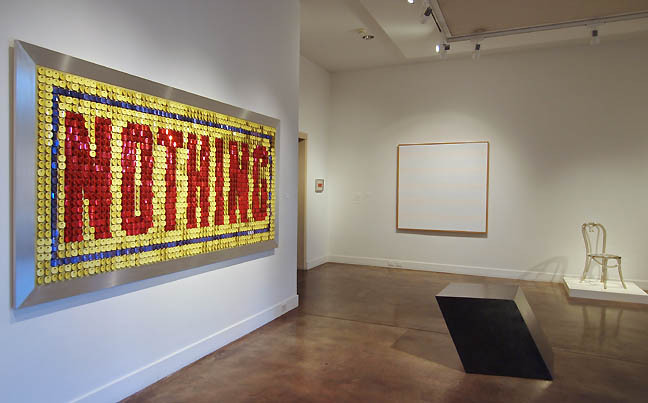 One is Open This End by Andy Warhol and the other is Jack Pierson's Nothing (Yellow, Red Blue). Of course, Open This End is eponymous to the exhibition, its a small work but it is flanking a doorway with that really wonderful Jack Pierson. Both use text based signifier of the void or at least open space. In particular Nothing is very different from a lot of Piersons that are made up of an amalgamation of different signage letters but Nothing ironically is a complete sign. Both works are signage having a conversation. 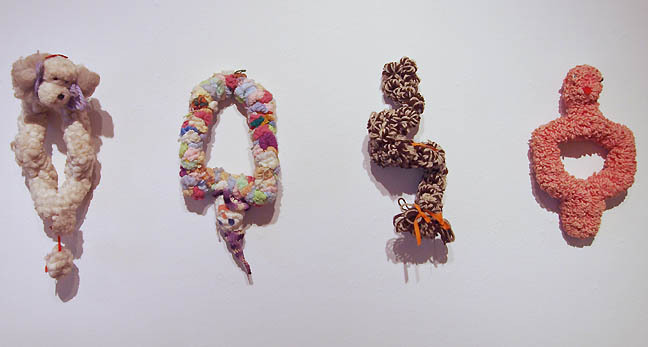 Can you tell us about both works and did you ever hang them together like this? 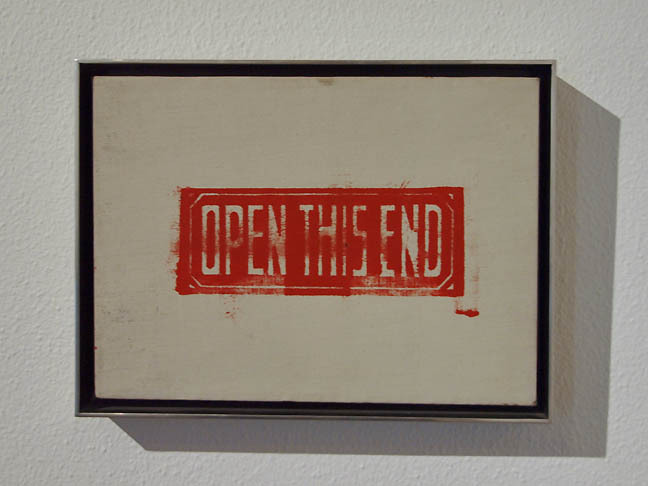 Both pieces are signage and Warhol's This End Open is literally open ended... the Pierson is even more open ended because it is quite literally this negative capacity of being Nothing... Warhol's work made Pierson's possible if we want to be art historical about this. BB: I dont think I bought one with the other one in mind, in fact I know I didnt. So I cant give you some intellectual response to my genius (laughs) ...but Open This End I bought at auction and I bought it because I could afford it because even then Warhols were pretty expensive. So it was wonderful to have an original Warhol at a reasonable price. I dont remember exactly what I paid for it but I think I paid less than $20,000 for it. As for the Jack Pierson, he was represented by Patrick Painter at the time in Los Angeles and I was looking for a piece for outside my house. JJ: But that kind of piece is essentially a purposeful intellectual vacuum... it isnt anti intellectual it is a very intellectually aware cancellation of over-cooked thought. It has that negative capacity to create breathing room. Sometimes you need nothing to make room for new things to emerge. Its like the ginger served with your sushi... it cleanses the pallet and aids digestion (laughs). What's more the Pierson and Warhol works create a kind of temple gateway... forget what you know, be prepared for new things. BB: Id like to see the two of them together.... I've never seen them that way together and Joe Wollin is a master of positioning. 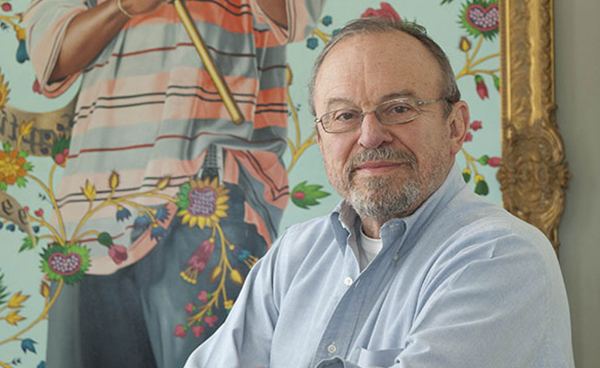 We are so pleased to have him as the chief curator and Barbara (Schwan) who is head of the foundation and an artist herself... she doesnt hesitate to say hey try this here or try that there and the two of them together are great. The three of the four installations of this show that Ive seen in person so far, they were all wonderful so Im not at all surprised that this one turned out wonderful as well. JJ: The "Nothing" gives a sense of freedom to the viewer, its the first thing one sees when they come in the door. It is so fascinating that you chose it with the idea that you were going to live with it, rather than just hoard it in storage like a lot of art as asset class collectors that we see today. When you had the Warhol display in your home did you move it around or did it live in a certain proscribed space? BB: Oh yeah I am inveterate when it comes to loving to move things around... adding a new piece then seeing who that new piece gets along with? I mean I joke about the fact that the day I have Alzheimers is the day I dont talk to my art. What I probably do is perhaps every 6 to 9 months I move things all over the house because pieces are different in different venues. If you take something out of the living room and into your bedroom there is a whole 'nother relationship to it and a new conversation ensues. To just put it in one place and leave it, well that is just not me. JJ: Im picking up a thread now just talking to you and looking at the work... one of the threads in the show is how you turn space over and upend it with work. Obviously Pierson's Nothing is a literal way of doing it but then it reminds me of the Martin Kersels video in the very farthest back wall of the gallery (near related early Acconci and Nauman wall works), In the Kersels Pink Constellation video the world literally is turned upside down where the people in the room are climbing on the walls and ceiling. Its this weird ergonomic shift where the main character in the video is constantly renegotiating with gravity and their personal space in comparison to the formal walls and expected use of a room. It sounds a lot like what you've done with the artwork itself in your collection. BB: That's an interesting analogy, Ive never thought about it quite that way but that is I mean that is the way Martin behaves when he walks around the room, always seeing things by different juxtapositions. When he moves around the house he is doing the same thing, I never thought about that analogy. That's fun. JJ: That interesting because I am also looking at your Robert Gober in the corner and it is literally a door into a corner. Its this total renegotiation of expectations for space so it makes sense that a collector who is constantly moving things around would choose that Kersels and that Gober. Even that early Acconci fits into that theme of an ergonmic exploration of space. What Im seeing is that you really dont see your home as a Museum or in search of some master narrative. For me there have been too many master narratives in art lately. But back to you, since there isnt some grand tapestry you are trying to weave perhaps there is an early particular piece that comes to mind that teases out a thread you want to discuss? BB: No no really in fact when we agreed to bring Joe (Wollin) in as a curator he obviously asked how many pieces I wanted and I just said , Everything is really up to you. He said, Rreeealy? and I said Yeah I want you to make the selections, I dont want to make the selections. and with that I think I added one piece and I vetoed one piece and that was it. Everything else he selected.
. In fact, this discussion reminds me of the interview I did with Kengo Kuma or an interview we did with Ed Ruscha or Jorge Pardo. All of them let emergent properties form and sometimes they take on new exiting angles. Its a very improvisational thing.. like jazz, you have an ensemble but they will reorganize themselves in interesting ways if the band leader chose well and lets them be themselves. Its like reshuffling the deck and taking your cards they way they are dealt. BB: Everyone always asks me what my favorite piece is but that is impossible... I cant even begin to think about it. 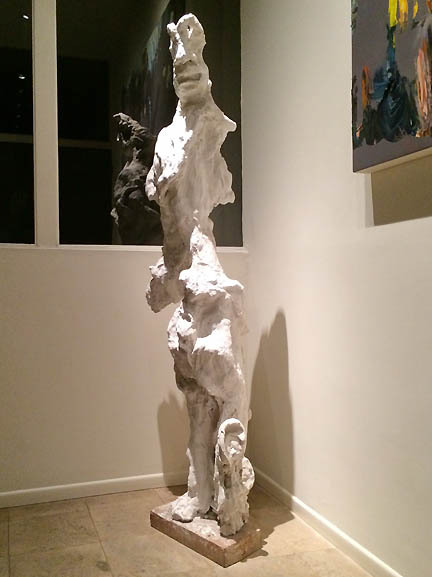 Of the six pieces that I bought at the first Basel Art Fair there was a Richard Tuttle and Mario Merz and a probably if there were one piece it would be a Martin Disler sculpture that stands at the front door to my house. He's a Swiss artist and it is a very grotesque man, reaching out as if he is begging and yet it is welcoming at the same time. I would say that has been at the front door of my house in New York and in Los Angeles ever since I bought it in 1989 so it may be that one piece but Joe didnt select it. I would have put it at the front door to the exhibit, that's how Ive always handled it. 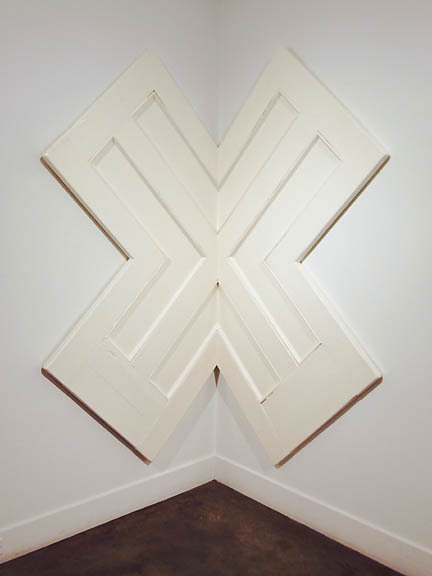 JJ: Its a lot like the word Aloha, meaning hello and goodbye or the Robert Gober which literally turns the dead end of a corner into a door, implying potential pathways. BB: But frankly I never asked him why he didnt include it but I think I will now but to answer your question... though not there that is the piece that represents the thread of what art is, not to be afraid of strange looking pieces and to look into them to see all that they can represent. JJ: It reminds me of that great quote by Bruce Nauman,in that he wants his art to encourage viewers to, "take an investigative attitude." 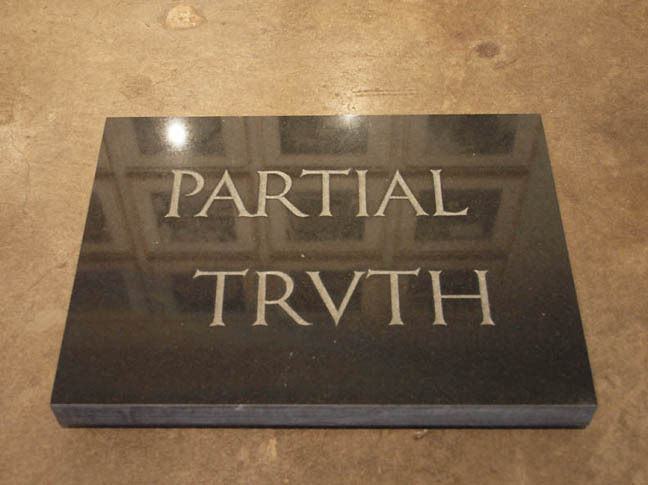 Which of course is a too-slick way to transition into asking you about the Partial Truth piece by Bruce Nauman in the show. 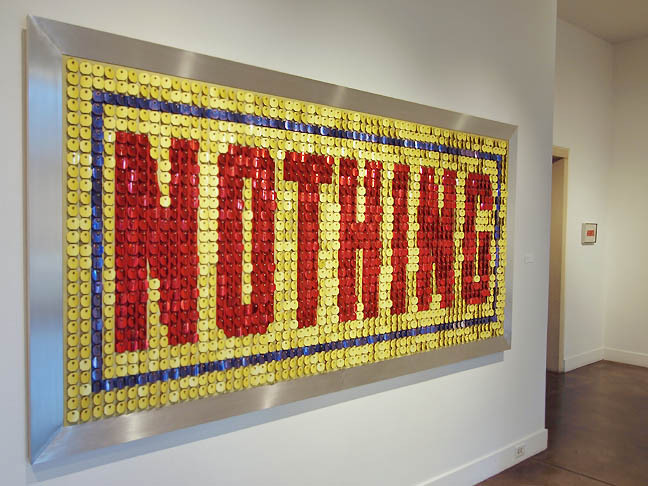 As it is installed here it certainly reads well with Pierson's Nothing and the Warhol (in the same room). As word art they all declare their contents. What attracted you to that particular piece? BB: Nauman. I've always enjoyed his work. I just happened to be in David Zwirner's Upper East Side gallery one day and it was sitting on the floor and I said is that who I think it is? He said yes, I asked the price and it was reasonable and I bought it. That's sort of the way maybe I have done the whole collection. Im one of those people who makes up his mind in a hurry and I dont worry about the fact that if we (the piece) and I fall out of things to say to each other that is ok I can de-access and let somebody else talk to it and Ill buy a new piece that I can talk to. JJ: The more we talk the greater the sense I get that it is not about ownership or trophy hunting than a process of keeping a sharp. It isnt propaganda for your sense of self as it is for some collectors or anything like that, its almost like a cast of characters who instigate chance conversations in your own living spaces. What I like about that is there is a sense of freedom one doesnt encounter in a museum as much because they are far more formal. That informality of encounter and conversation as you call it makes it far more alive. There isnt this pressure of standing in front of art and expecting to have an experience, which is a bit awkward like a school dance. Instead, it can just sort of happen. I like that kind of vibe... where the experience isnt groomed so much. BB: Im not trying to prove anything. As a personal collection I just try to enjoy. Does that make any sense? JJ: Yeah, It shouldn't have to be a grand statement... leave that to the artists themselves. A patron as a collector can extends the influence of the artist by living with the work and letting the work live beyond the artist's planning and intentions. Part of living in a free society is enjoying your growth as a being and it is wonderful that you are sharing this with us. Ive seen the show 3 times now and we just dont get shows like this very often. To pivot to the Steve McQueen video on display at the Portland Art museum as an extended multi site aspect of this show. It is great that they were able to present it. That rolling barrel in that video, Drum Roll, is once again a renegotiation of space as a kind of happenstance life encounter. It reflects your approach as a collector by presenting the way a camera sees a certain way. 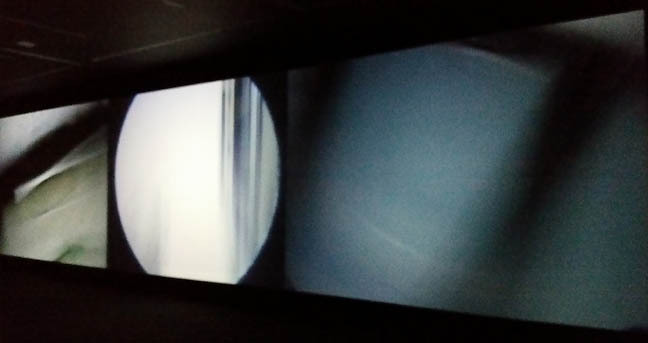 It turns the world upside down and puts the viewer in a spin cycle rolling through the gallery as the video is shot with a camera placed within a rolling drum. How did you start collecting video and new media work like it? Was it right off the bat or did it take awhile? BB: Well, I cant remember exactly when but Ive been sort of critical of video work because Im an ex television guy and we have always been so careful. Like when we edit a news story. We always made sure things looked just perfect. God knows it wasnt always successful, many times not but the attempt is there to really edit the piece perfectly and narrate it accordingly. So I wasnt a big fan of video when I started out. One, because being in television I had A.D.D. and many of the pieces were just long and boring to me. If we were into it more than 2 or 3 minutes and we werent telling a story or starting to relate to a story then Im ready to move on. So in the Steve McQueen Drum Roll video I thought that was a very interesting form of narration about an experience. Therefore it held my attention all the way through and I even wanted it to go on further if he had done so. I cant remember the year I bought it but that was one of the major pieces... that and the Martin Kersels both being important videos in my life. I have the Jennifer Steinkamp (Jimmy Carter). I bought that and cut holes in my house and its home is the wall above the swimming pool. JJ: So wonderful that you live with them. So many have video works and dont have them on display, I know the Kramlichs (top video art collectors) have really taken to living with new media work. It is also so refreshing to hear how your collecting of video work comes from a critical position. As someone who is collecting a relatively new genre you are setting precedents and professors will write the dissertations on those who bought and lived with this work. I feel the same way as you do, that a lot of video is self indulgent, in fact for my money that Jennifer Steinkamp, Jimmy Carter is one of the best video works of this century so far. It's political in nature given the title but its more like a portrait of Carter's bearing in a wall of swaying digital flowers... almost in the way a bronze sculpture didnt actually have to be a mimetic likeness to be a likeness. Its a crucial piece, an all time great. BB: Id love it for Trump to have it in the White House and look at it every day and think This is what our administration should be. JJ: (uncomfortable laughter) We can only hope but somehow I don't think he'd appreciate it, which is part of the problem. BB: I may seem very sappy right now but Im gonna offer it to him. I dont know any Republicans but Im sure I can find one. Its wonderful that you brought it up. He could put that piece in the White house and look at that and think, this is what the world should be. 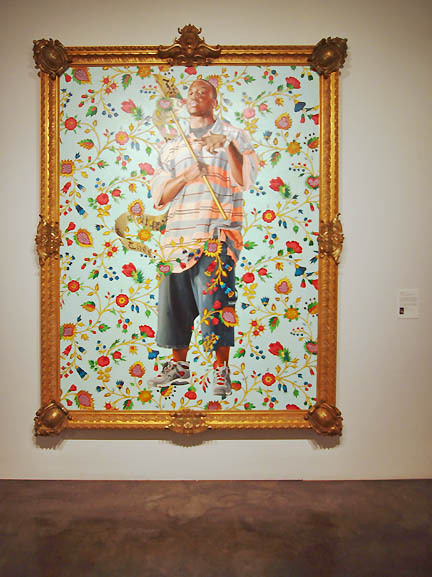 JJ: What your curator Wollin has done by pairing the Steinkamp with the Kehinde Wiley St. John The Baptist II on the outside of the room where the video is on display is also wonderful because it shares a floral motif that also projects identity. There is a great book by the Beyeler Foundation on abstraction and ornament but it applies to the portraiture of both these pieces... the ornamentation in a way projects the aura of that which is depicted while acknowledging the artifice. I think someone like Oscar Wilde would have loves those two together. 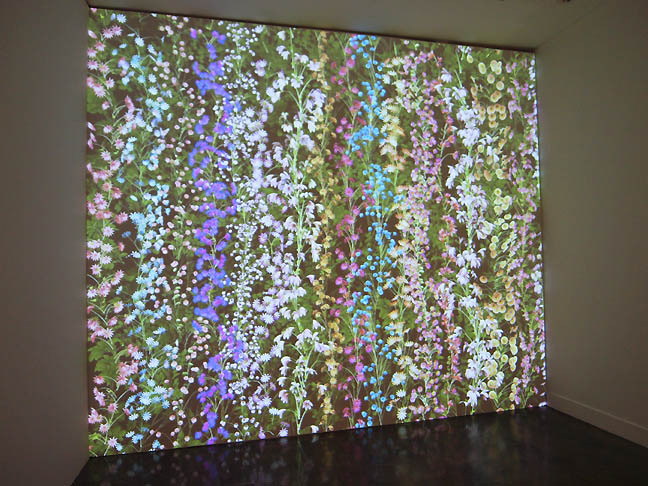 The Steinkamp video will cover you in flowers if you walk in front of it. The same sort of thing is happening with the Kehinde Wiley but it is more like the heraldry at court. Wiley is more formal a brand so it is a great contrast. Two pieces of art can have a conversation. Both are about personal projection and at the same time its an artist who is crafting that projection. In this case Wiley presents this fellow in his striped shirt and baggy shorts as a martyred saint. What lead you to acquire that piece? Basically, he was represented by Roberts & Tilton Gallery in Los Angeles, still is... one of the few who hasnt jumped ship for a bigger named gallery. I thought that painting was fantastic. At the time his prices were a steal I thought and a young artist and I thought, hey Im known to support young artists, not all of the time but with some consistency and so I just bought it. It was in Columbus Ohio and he did 6 paintings there that the museum there already had in their collection. I happened to be there and went to that opening, Roberts & Tilton represented him and I bought it there through him. Again a brand new artist. JJ: As I look around the collection I see this vitality. In particular there are the Four Wire Sculptures that are made from stuffed animals by Mike Kelley. They are so fresh. There is a sense of life and discovery about them. They are fragile but at the same time that gives them power in their quirkiness, kinda like a daydream of childhood rather than actual childhood. Care to speak about them? BB: For the most part they have always gone in my bedroom. I have tried them other places but they are not as effective to me as they are in my bedroom. They are almost in a sense bringing your childhood to you as an adult and remembering the good days and also remembering the fact that these are found objects and they represent a certain amount of thoughtfulness about people who did not save them and I often wonder if they wonder where they are? I just find them wonderfully uplifting. They make me happy and Im glad Mike saved them so that I can enjoy them. JJ: Yes they are wonderful and I miss him... I have a great fondness for his work. He reminded me of some of the kids that I maybe only visited their house one time... but then they moved or I moved. His work is always uplifting for me. 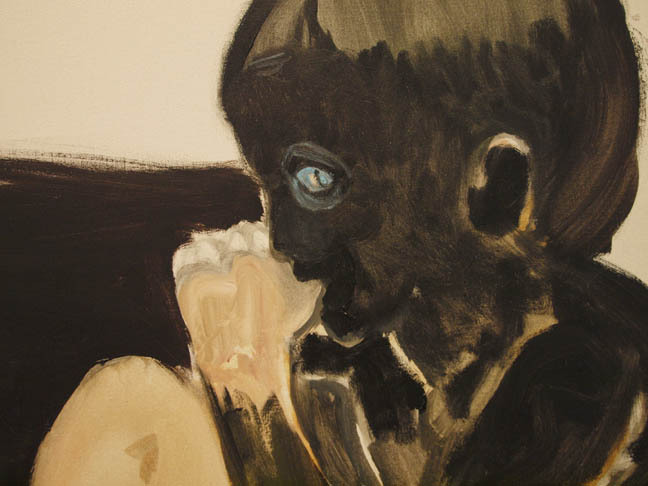 Now another artist you have in the show Marlene Dumas is an artist Im not all that convinced of. You have a lot of her work but there is one in particular on display in the back of the gallery that has me reconsidering her. The one called Thumbsucker. Like what you were talking about with the Mike Kelley... keeping this sense of childhood but perhaps of a darker vein. It isnt just child like, its intriguingly serious. Can you tell me about it? You obviously have an affinity for her work. BB: Its one of the earliest ones I bought and I was most fascinated with the fact that it was a biracial situation. Ok... so When I bought that I had only been collecting for 3 to 4 years but I was totally unfamiliar with anyone who had done a bi racial painting like that. I thought the biraciality with the thumb sucking was where they said the were black or they said they were white. I thought it was a wonderful example of egalitarianism instead of assuming one is one way or one is another. So we are looking at the early 1990's and we are still going through it today. Arguably its even worse now than it was almost 20 years ago? I started collecting her drawings in 1989 and I dont know if the drawings are up in that exhibition... they didnt have enough room for them but I have about 20 piece by her so I think her work is pretty fantastic. I realize her work is not terribly consistent. A lot of artist will toss something if it isnt absolutely perfect and I thought about that with Marlene I go well good for her saying, Hey Im not perfect also. Ive never broached that question with her but I just love her work and think she is an extraordinary artist so I hope this exhibit helps you enjoy her more. JJ: I think that is what I am involved in the art world for... to come across new things that challenge the views Ive accumulated through experience with new experiences. Thumbsucker is like a lot of things you collected... they express a state of flux or options. To me it had this Janus-like dichotomy and the thumb sucking seemed to be a comment on the parochial dialectic in childhood and race. Like anyone I might come with preconceived baggage but this painting is convincing to me. Its like matter and antimatter for me. I believe most art lovers arent in it to see a reflection of past assumptions. It is the stuff that throws a monkey wrench in that becomes salient and powerful. JJ: Eh, I have a fascination with ecriture, Greek myth and the traces of time so looking back decades later I can say yeah that's why I got into his work so readily. Cy Twombly's work also strikes me a little like that great Agnes Martin you have on display in the gallery here. Basically time spent monastically and poetically at the same time. 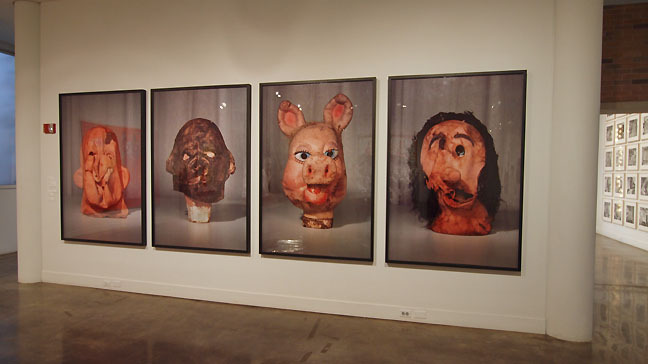 But perhaps we should conclude by talking about those Paul McCarthy masks. They are grotesques and really in your face or perhaps looking at them you imagine them on your face. Its an encounter. They set off the largest gallery space so well. BB: I chose them with the idea that they were light and fun and and it was before he hot really dark. Im not sure where I come from with some of his darkness but I thought they were totally different. Then what I did is put them in the dining room I had up until recently in a residence in Paris. It was a very good sized dining room so I had 2 of them in the dining room in Paris and 5 here in LA. JJ: Dining room wow, permanent dinner guests. 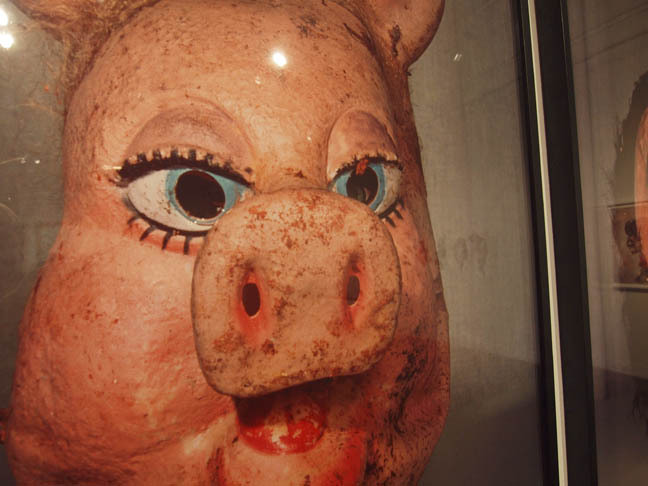 BB: I had 2 in Paris and people would say, why did you put them in the Dining room and I said because people come in and sit down and if they are meeting each other for the first time one of the first things they is talk about the masks or they talk about the art on the wall. So I want to have something that is conversational so those masks are just wonderfully conversational and yet really good art. Ive always looked at them as adjuncts to entertaining! JJ: Well its just wonderful they really set off the room. As we have been talking people who are clearly not students are coming in to see the show and with the world the way it has been people are looking to art for new perspectives. I hope you get to see the show and enjoy it like we have been up in Portland. BB: I hope so too. My health is improving and my daughter and my former wife and her husband all came and just loved it. I thought it was a great compliment to me, they really participated by going to the lectures and sorry I couldnt be there for the family reunion. A nice thing. Im glad it has been so appreciated,after all Portland is such a part of our family heritage with my daughter graduating from Lewis and Clark so the purpose of the exhibition was to share it with a university where the family had an association. I can say its just been a total joy and a fantastic positive reaction and couldnt be more pleased.